In 1954 the Boorowa News provided the following estimates of town and district populations of the twelve “Group Nine towns”. These seem to be reasonable estimates. 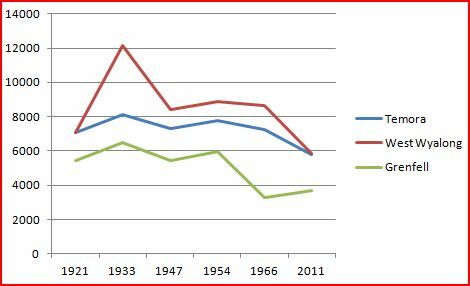 I’ve downloaded Australian Bureau of Statistics historical census data, and came up with the following information and analysis. (1) The population of Maher Cup country has declined by at least 15% since its peak. (2) In relative terms this decline is greater. In 1921 the 72,666 people above accounted for more than 3.5% of the population of NSW, in 2011 only 1%. (3) With employment dominated by agriculture, transport (particularly rail) and services to farmers the decline was inevitable, as few new labour-intensive industries have emerged. An example of significant population decline is West Wyalong. 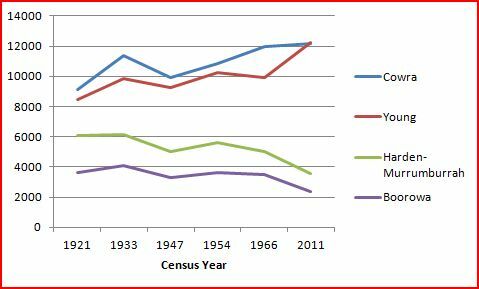 The Bland Shire and the towns of Wyalong and West Wyalong experienced very rapid population growth in the 1920s. This was the result of rail construction and closer settlement, often with soldier settlers. Large grazing properties were subdivided into small farm holdings. Sizable villages, largely self-sufficent in services emerged; such as Barmedman and Ungarie, Tallimba and Tullibigeal, Weethalle and Burcher. Wyalong and the Bland grew from 7,041 people in 1921 to 12,133 in 1933. But the thirties with depression, drought and dust-storms, and ending in war, saw a major outpouring of people. Many people who went abroad to fight in the war or worked in war support industries in the cities didn’t return. 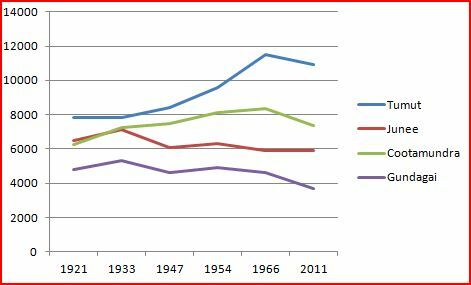 The population stabilised at 8,000-9,000 until the 1960s when farms were increasingly consolidated and mechanised, greatly reducing the number of farming families and the labour requirements. Families became smaller. While some new industries have been created recently, such as the Lake Cowal gold mine and a large egg-production plant, today West Wyalong and its rural surrounds contains less than 50% of its 1933 population. The growth of corporate agribusiness – where farms are consolidated, fences removed, and large scale grain production replaces mixed farming – promises further population decline. (4) Only three towns and their shires have grown or maintained their populations: Tumut, Young and Cowra. (5) In short, big places tend to get bigger and smaller places get smaller. Today’s big places are outside Maher Cup country. Wagga has grown almost tenfold since 1920. Canberra with one third of a million people hardly existed when Ted Maher came to Tumut in 1920 with a Cup. For folk in The Bland today much business is done in Griffith and Wagga; Wagga is also a magnet for people from Temora, Junee, Cootamundra and Gundagai. Canberra is less than 90 minutes from Boorowa and Harden. (6) The period of the Maher Cup coincides with the golden years of development and community in the South-west Slopes and northern Riverina. My memories are of vibrant little communities. We went to annual picnic events at the Mildil hall, drove all the way to Barmedman to dip in the mineral pool on a scorching day, entered the pets in the agricultural show. A thousand people would attend the Bland rodeo in the middle of nowhere, swaggies would still call, and a kind shell-shocked man called Fritz would engage my mother in the street and commence a conversation only they knew the meaning of. We lived and breathed our small environment. It was a time when Sydney was the world beyond, a place that most had never visited. This entry was posted in Demography, Communications & Media and tagged Barmedman, Boorowa, Cootamundra, Cowra, Grenfell, Gundagai, Harden-Murrumburrah, Junee, Population Statistics, Temora, Tumut, West Wyalong, Young. Bookmark the permalink. I have a memory of going to Gundagai to watch Maher Cup .must have been 1949/50. Had to climb on back of a truck to get to oval as river was flooded. No long bridge in those days.